Following ROTHTEC®’s design file specifications helps to produce the best results for your product. ROTHTEC® recommends uploading a TIF, AI or PSD file at 254 ppi and above, resolution 10. All digital images have pixels. The ppi is the number of pixels in a linear inch and is also referred to as the resolution of the image. We can work with various formats and convert them if needed. The better the quality of the art or file received, the more control of duplicating the final outcome to be the colors and sharpness desired. ROTHTEC® has found that customers that supply their own cloth are more satisfied as it better reflects the final outcome. We will repeat your design to fill the space of the fabric supplied. We are set up to print on print 60” wide cloth and are equipped for all different fabrics. We have the capability of printing many different fabric types because of the versatility of our printers; they have been customized to accommodate a variety of printing types from lycras to knits, cotton jersey, rib, stretch jersey, cottons, linens and poly. Digital printing offers many advantages, one being the unlimited colors giving enormous potential to the patterns that can be designed, proving for a better presentation of designs. ROTHTEC® does strive to achieve customer approval in digital printing but it must be noted that some colors are not achievable; there may be colors in your image that cannot be reproduced. Cotton based fabrics will print some colors on the duller side, while poly based fabrics can print more vibrant cleaner shades of color. 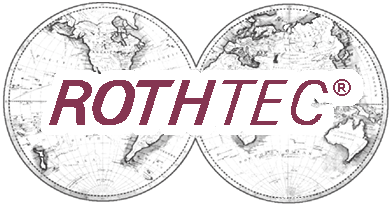 ROTHTEC® posts this info as a guide to open the door to our discussions and evaluate what services we can offer. We look forward to reviewing your wish list and move forward with your projects in the very near future. Please feel free to schedule an appointment to come in and meet us and, if possible, it would be great if you could bring your designs and/or fabric samples with you and we can discuss pricing and time line.